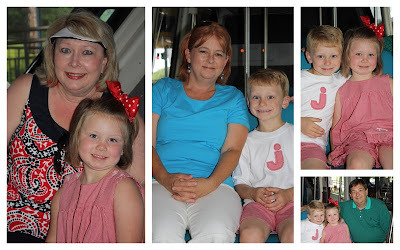 Today (Monday / Memorial Day) we started the day with one of my favorites about Disney World... 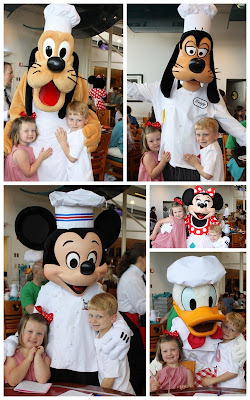 Chef Mickey's! We rode the Monterel (sp? 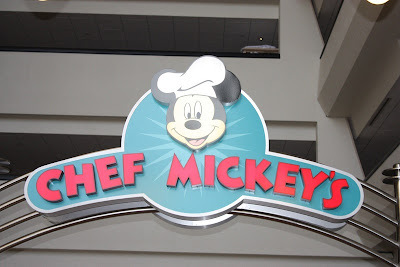 )since it goes through The Contemporary which is where Chef Mickey's is... the kids were very excited about riding it and about eating with mickey! 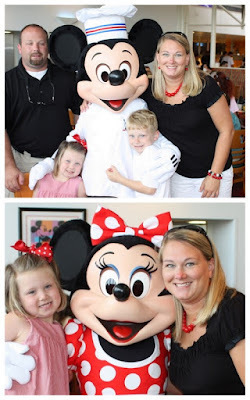 We enjoyed Chef Mickey's! We even managed to get a family photo which are rare b.c usually there is no one who can take a picture with my camera but father in law came through and we managed to get a cute photo! 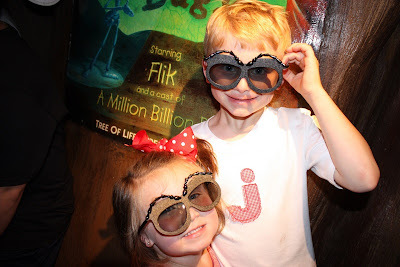 the kids LOVED it... check out their faces! one the way to the park from breakfast the kids got a BIG surprise... they got to ride in the front of the Montereal with the driver... they thought they were something else... they even got "drivers licenses too"! One of the things we did was watch It's a Big Life. 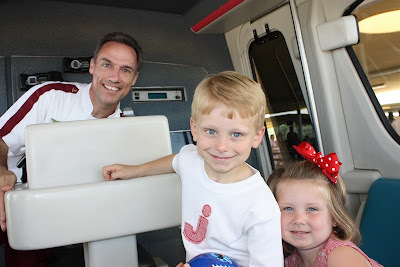 Jackson and I waited in a line for about an hour to ride a ride (can't remember the name) and brylee was too short to ride it so daddy took her to the playground. She loved it. There was a door that you opened and it would say "close that door" and she thought that was hilarious!!!! After a few things we were ready to go it was SO HOT! So we went back to my parents hotel to swim and slide. 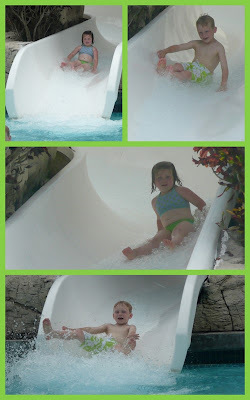 The kids LOVED the slide!!! It then started to rain (as always in the afternoon/early evening) so we decided to eat in the Italian restaurant in the hotel... had no idea it was white table clothe, and "fancy". 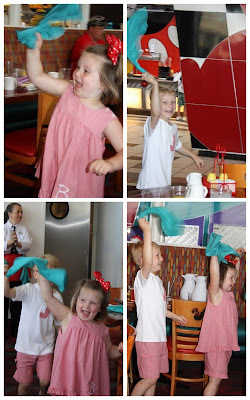 Thank goodness our waiter had kids and was great with the kids. This is where i said "pretty women did not hold a candle to my kids... LOL. 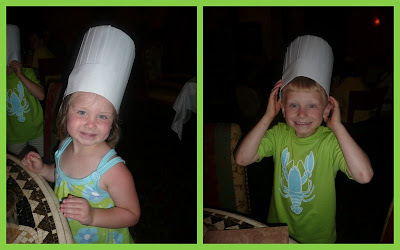 The waiter gave them chef hats before we left. Yes they are wearing the outfits from last night... it is what i grabbed to put on over the swim suits and then we got stuck b.c of the rain so we had to wear them to dinner... i know you were wondering :) HA! It stopped raining so we headed back to our hotel to change clothes and then head to the park and no sooner than we got out the door it started raining again... we gave up and turned in for the night. GoGo "walking the puppies"... the kids really did not wear these that much (esp. Jax) but they liked "playing" with them. 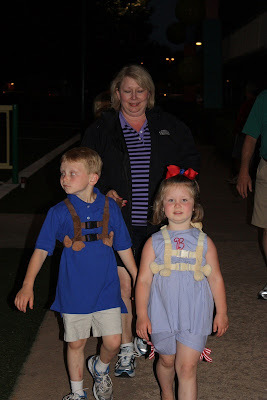 But brylee thinks it is funny to run off so we made her wear it at night so we would not loose her. 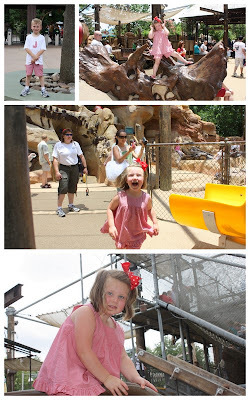 Yes I was one of those moms i said I would never be... i put my kid on a leach... but at least i did not loose her! It was a good day I think there favorite part of the day was swimming and sliding... go figure!